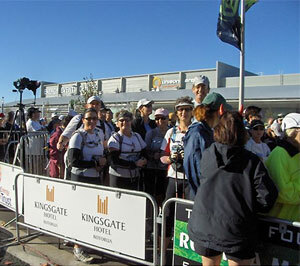 Nordic Walkers just prior to the start of the Rotorua Marathon (L-R): Bob Neilson, Karen Cooper, Kaye Rollinson, Margaret Hudson, June Stevenson, and Paul Stevenson. Absent: Helen Robertson, Mary Cunningham. A group of Nordic Walkers, from Auckland, trained for several months, with the goal of completing the Rotorua Marathon (42.2 kms). To provide meaning (or sense!) to their goal, the group utilised their efforts to promote awareness of Osteoporosis. While this is a debilitating disease, potentially affecting all women and 30% of men, osteoporosis does not have a high profile, and perhaps, does not carry the same emotional responses as other diseases. The benefits of Nordic Walking may provide a proactive way to reduce the effects of bone loss and are precisely aligned to preventative strategies. Despite the fact that osteoporosis is widespread and on the increase, few people understand the root causes, and what can be done to slow it's progress. Bones are living tissues, constantly undergoing degradation and regeneration. Osteoporosis is the loss of bone quality and quantity. The causes include: menopause, low body weight, digestive absorption problems, arthritis and some medications. 1 in 2 women and 1 in 3 men will suffer an osteoporatic fracture. It has the potential, because of menopause, to affect all women. Bone loss is greatly accelerated after menopause as the ovaries stop producing estrogens. Estrogens facilitate the uptake of calcium into the bone. Calcium is an essential mineral, deposited into the bone, during regeneration. The problem occurs when bone regeneration lags behind the degradation phase. Peak bone density peaks at around the age of 30 years. After this time, bone mass gradually declines. Bone loss is gradual, often going undetected until a fracture occurs. The most common fracture sites are the wrist, spine and hip. Severe cases lead to loss of height and the spine may curve to form a "dowager's hump". "Fractures caused by osteoporosis are responsible for more days spent in hospital than most other diseases including breast cancer and heart attack". Recommended lifestyle changes include physical activity that is weight bearing. This encourages greater bone mineral density, and the effect is specific to the bones that receive the most loading during exercise. Nordic walking is a weight-bearing exercise. The poles provide resistance to the vulnerable bones of the wrist and spine. The poles provide stability, improving posture and reduce the risk of falling. As this is an outdoor activity, exposure to sunlight enhances Vitamin D production, which is essential to the absorption of calcium. "The Board of Osteoporosis New Zealand Inc. has asked me to sincerely thank you for your very generous efforts in organising the donations we have received in support of the Auckland Nordic Walkers in the Rotorua Marathon. Substantial donations such as yours mean a great deal to us and make a considerable difference to our annual income. We will utilise some of the interest to fund research into osteoporosis and other substantial projects as they are developed. This certainly fulfils our vision of 'building better bones for New Zealanders"